We’ve had a lot of rain around here lately. Sounds like we may have even had some records broken for the month of May. It seems like the drought we’ve been watch should be over, but it takes years to soak in and fill underground aquifers. Looks like all the flash flooding is mostly a big hassle. To add to the frustration, since we have been in drought conditions, there’s a lot of shrinking and cracking in the soil around the foundations. Of course when we get a big, heavy rain the water runs right down the gaps and cracks on the exterior of the foundation. This is when water comes in stone foundation walls, and sometimes floods poured concrete basements too. Go ahead and panic. But just long enough to pick up the perishables from the floor of the basement. Once that is done, keep a cool head. If water is simply running across the floor into the drain, mop or wet vac the water and get one or two oscillating fans running and leave them running 24 hrs a day. Add a de-humidifier specified to the square footage of the basement. Set it up so it has a drain hose attached, set the machine to come on and run at around 50% humidity. In other words, set the fans and dehumidifier to run automatically, pretty much year round. In stone wall basements move all the storage three feet out from the foundation walls. This is opposite of what most people do, but when personal belongings are moved out from the walls, the belongings start to dry out better, and the walls sweat less because the fans keep air moving past. When a basement is set up and kept dry and fresh it will smell better and the stored items will be in better shape when brought back out. The first thing to confirm when water comes in the basement is the proper function of the gutters, downspouts and splash blocks or downspout drains. Make sure the water is getting away from the house through the gutter system. Then make sure the house has good negative slope all the way around the foundation, even under the deck or open porches. The function of good negative slope is again to move water away from the house. If your house has a gap along the foundation wall from the effects of drought, fill the gap and tamp the soil in. This will deflect water. Concrete flat work poured up against the foundation will benefit from a mortar or flexible treatment to keep water from running in any gaps. Once you’ve taken these measures, the only place water will come in the basement is up through a cracked slab, which is common in antique houses, or under the footing and into the basement. At this point a sump system may be needed. Take your time. Start on the outside of the house first. Lots of basement water problems are solved in the gardens outside. Don’t tear your basement to pieces until absolutely necessary. 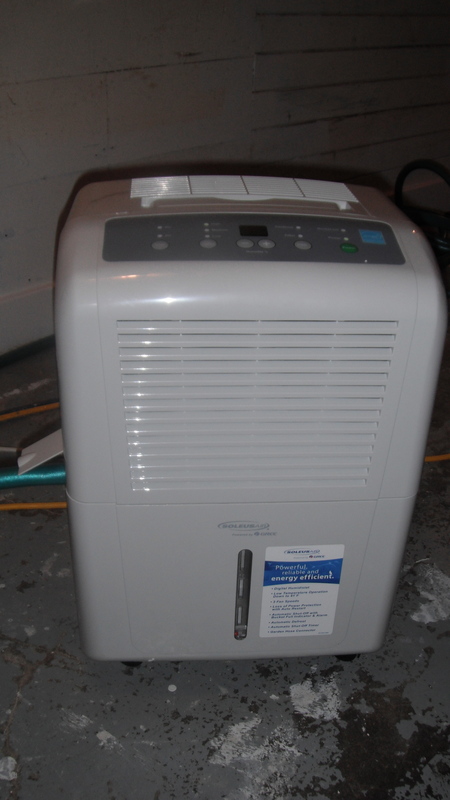 Keep the fans and dehumidifier going and you’ll have a fresh basement. Tags: basement, stone foundation walls, sump pump | Permalink.